Phenom Unleashes Super Advanced, Elegant Watch Phone: A Quad-Band, Dual SIM Cell Phone Watch that Works Almost Anywhere in the World: Holiday dreams do come true. 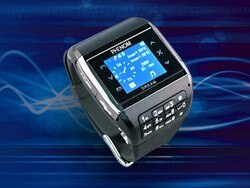 The Phenom Watch Phone "Dream" is a quad-band, dual SIM cell phone watch, MP3 & video player, digital and video camera all in one, cool-looking wrist watch! Made for executives, the Dream works almost anywhere around the world. enabling users to have two phone numbers in one, sleek device. Holiday shopping won’t disappoint this year as Phenom Communications Inc. launches the Dream: an unlocked cell phone watch enabling consumers to have two SIM cards and two phone numbers in one cool-looking, elegant watch phone. The Dream offers super advanced quad band technology, and can be used almost all around the world. It also features an external key pad, a full color touch screen, MP3 and video player, digital and still camera, USB drive and much more – all on your wrist. With the Dream you can have one number for business and one for family and friends, you can choose your preferred carrier at anytime and you can use a local SIM card when travelling abroad while continuing to receive calls from your home base number. Other Phenom Watch Phone Models include the SpecialOPS and Mi5 Watch Phones . 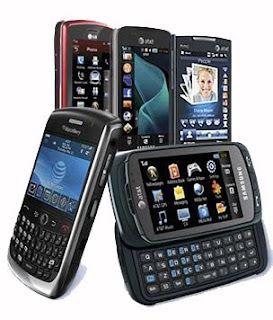 Both models are fully functional unlocked GSM cell phones and work with most cell phone GSM carriers, have color touch screens, built in microphones and speakers, MP3 and MP4 players, and digital and video cameras. With all Phenom Watch Phones, you can take notes with the compact stylus or record dictation on the run. 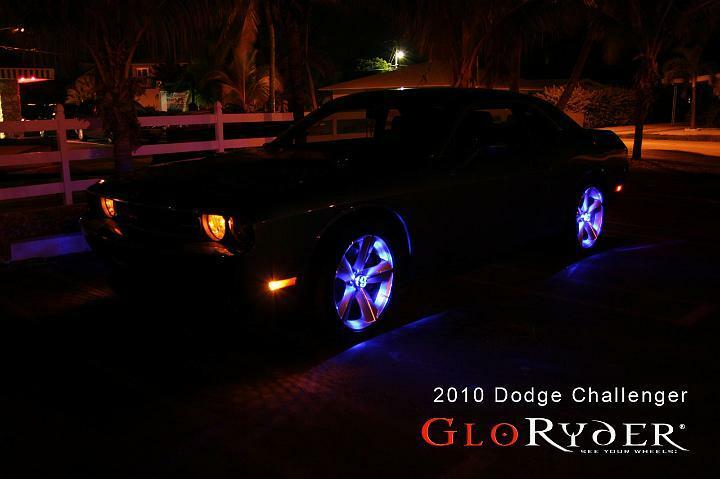 Lighted Car Wheels Go Mainstream Using GloRyder® Technology at SEMA 2009: The hottest new trends in wheel designs are eagerly anticipated at the annual SEMA Show in Las Vegas, but this years event featured a new technology that may very well change the face of the wheel, allowing consumers and manufacturers alike to display their wheels at night. The dark age of the wheel is over. Let there be light! Seeing is believing, and for the first time SEMA attendees walking by the DUB LIVE! display at the entrance of the building, as well as the TIS/Dropstars booth inside, could clearly see the wheel manufacturers logo brilliantly displayed and back-lit by GloRyder® Wheel Lighting Technology. The wireless technology lights the wheel face and center cap logo with a brilliant glow at night. 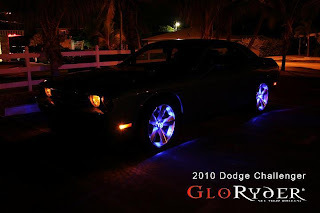 www.GloRyder.com Many people may not have realized the lighting was more than just a display it was actually a part of a new wheel design. Wheel manufacturers and consumers with high end wheels share the same desires, they want to display their wheels for all to see. For a consumer it may mean the prestige of owning a fine set of wheels. For the manufacturer it means revenue, as anyone admiring those wheels may want to purchase a set. The problem for both consumers and wheel manufacturers is that when darkness falls those wheels, no matter how fine, fade to black and the thrill is gone, and we all know night time is the right time to cruise. "We really don't have to try too hard to sell the product once people see what it does" said Lance Bartels one of the company owners and co-inventor of the product. Bobby Williams, another owner said "Now that wheel lines like TIS/Dropstars have figured out a way to take advantage of our technology, and display their wheels at night, I think you will see other manufacturers signing on to the idea. When you pull up to a stop light and see a car with lit wheels, and a car next to it with dark rims, there is no comparison. Your eyes are going to be drawn to the lighted wheels, it's just human nature." Wheel manufacturers that don't pick up on the trend may literally find themselves left in the dark. No pun intended. We know there are still skeptics out there saying "Is there really a need for this"? 3 Billion dollars in decorated wheel sales in the US market alone seems to indicate that there is. (Source: CNN Money). "I don't see what we are doing as starting a new trend" Said Kurt, one of the Bartels brothers and co-inventor. "People just like to see their wheels. I think with manufacturers the need is there to publicize their wheel line and be recognized even at night. That is a marketing tool they never had before. Just walk around SEMA for four days looking at one wheel company after another vying for attention. The competition is fierce, brand naming is important. Why wouldn't a wheel company want a consumer to know that is their wheel sitting next to you at a stop light? At the same time, why wouldn't a consumer want to see the wheels they paid for? It's a not too hard of an idea to sell. We feel like our idea brings the wheel into the 21st century"
Automiq Power & Light. LLC closed down it's operation in Nevada this year, moving the business out to Florida. It is now under the new ownership and management of Bobby Williams, Bill Laffler, and brothers Kurt and Lance Bartels, the original inventors and patent holders of the product. The new management has been able to significantly lower the cost of the product while bringing up quality control. The company is the worldwide manufacturer and distributor of GloRyder® products and has signed contracts with Mike Konkel of Hawk West Marketing, one of the top marketing firms in the country. Only time will tell how this new technology will effect the wheel industry, but for now, dare we say, the future is looking brighter for lighted wheels. The guys at GloRyder are pretty friendly, drop in on line or give a call for more information. Magnalight.com Unveils New High Powered 100 Watt LED light with 9000 Lumens: Larson Electronics’ magnalight.com introduced a new high powered LED light that offer 50,000 life hours, waterproof construction and 9000 lumen light output. Operating on 9-50 volts DC, the LED10W-10R 100 watt LED light (http://www.magnalight.com/p-46762-100-watt-led-light--9000-lumens--9-50-volts-dc--adjustable-surface-mount.aspx) is a durable, even light alternative to halogen, quartz and HID lights for vehicle, boat and equipment lighting applications. Further building on its extensive array of low voltage LED lights for vehicles, boats and equipment, Larson Electronics’ magnalight.com unveiled their latest LED light, the LED10W-10R. The 9000 lumen, 100 watt LED light offers spot and flood beam patterns and is available in black or white aluminum housings. Measuring 20 inches long and less than 3 inches tall, the sleek LED10W-10R LED light contains 10 individual 10 watt LEDs, each producing 900 lumens, for a total of 9000 lumen output. The LED10W-10R works off of input voltages ranging from 9 volts to 50 volts DC and draws less than 9 amps on 12 volts DC and less than 5 amps on 24 volts DC. A heavy gauge pigtail in terminated in a 2 pin Deutsch connector and an including wiring harness offers a relay, switch and 20 feet of wire for installation. “We have a whole line of high powered LED lights based 10 watt LED technology that we continue to extend,” said Rob Bresnahan with magnalight.com. “However, this is the first time we have a long, bar style format. With a long, thin format LED light, these can be mounted in areas where space is tight or where aesthetics matter, like boats and other vessels. Construction and military vehicles can also benefit from having high lumen output in a very low profile format. These LED lights sleek, lightweight and easy to mount. As such, we see a wide range of applications, where 500 watt quartz lights (https://www.magnalight.com/p-1732-work-area-light--500-watt-quartz--pedestal-base-mount-with-handle.aspx) and High Intensity Discharge (HID) lights are employed. As we put together more powerful LED lights, like the LED10W-10R, with 9000 lumen output, we are seeing operators of vehicles, boats and equipment switching from high voltage metal halides and high pressure sodium lights to these LED lights. Operators can discontinue use of onboard generators and remove the extra wiring associated with high voltage. A few of the larger LED lights can operate off of the same alternator and battery configuration already available on the vehicle, boat or equipment. With 50,000 life hour ratings, 9000 lumen output, waterproof construction and a low profile form fact, the white, even lighting produced by the LED10W series, new applications like license plate recognition and other types of vehicle and personnel recognition with video capture are proving to be an effective solution. Larson Electronics’ magnalight.com offers a wide range of LED lighting, ranging from portable explosion proof LED lights to high powered vehicle and boat LED lights. Covert LED lighting, like the LEDLB-24-VIR infrared (IR) LED lights (https://www.magnalight.com/p-1981-mrap-light--visibleir-light--24-leds--72-watts--900l-x-100w-beam--4320-lumens--9-32-volts.aspx) popular US military vehicles. You can learn more at magnalight.com or 1-800-369-6671 (1-214-616-6180 international). Shop New High Powered 100 Watt LED for LE$$ / To See more Products Click here! Kanguru Solutions Makes Hard Drive Duplication Easy And Affordable: Kanguru Solutions has released a new full featured, entry level, hard drive duplicator. It has all the features people have come to expect from Kanguru Hard Drive Duplicators, at an incredibly affordable price. It is a perfect complement to our larger scale duplicators. 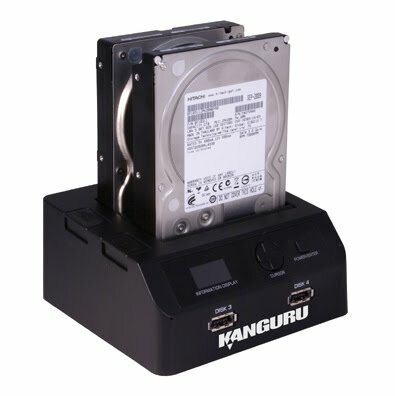 The Kanguru HD Duplicator Mini Clone (http://shop.kanguru.com/index.php/duplicators/hd-duplicators/kanguru-hd-duplicator-mini-clone-1-target-hard-drive-duplicator) is an ultra compact, stand alone 1 target Hard Drive Duplicator. In the high priced hard drive duplicator market, the Mini Clone stands alone as an affordable solution with all the features of the higher priced models. The Kanguru HD Duplicator Mini Clone has multiple interfaces for connecting drives, so users can copy to and from almost any storage device: 2.5” or 3.5” SATA Hard Drives, USB external hard drives, eSATA external hard drives and even USB flash drives. SATA connectivity allows for up to 120MB/s data transfer rates making it faster than ever to duplicate a hard drive! A sharp OLED display and intuitive user interface makes the Kanguru HD Duplicator Mini Clone extremely quick and easy to use! Just attach a master drive and a target drive, select the copy mode and begin making copies. The Kanguru HD Duplicator Mini Clone can also be connected to a Mac or PC through USB or eSATA, allowing it to use any one drive connected to it as an external storage device. ShopNBC Launches Online Cellular Store, Powered by Simplexity: ShopNBC (NASDAQ: VVTV), the premium lifestyle brand in electronic retailing, today announced the ShopNBC.com Cellular Store (http://wireless.shopnbc.com/), featuring mobile devices and service plans. The new online destination at ShopNBC.com is powered by Simplexity, a leading online retailer of cell phones and home services. As part of the network’s ShopNBC Anywhere initiative, customers can shop via cable and satellite TV; online at www.ShopNBC.com, and streamed live at www.ShopNBC.TV. ShopNBC customers now have the ability to research and buy mobile devices, accessories and service plans through the ShopNBC.com Cellular Store. With over 400 items from the top wireless providers in the country, visitors can browse hundreds of wireless devices from LG, BlackBerry, Samsung and more by phone type, service provider, or rate plan as well as order accessories for mobile devices. Users can also upgrade their existing cell phone and service plans with ease. 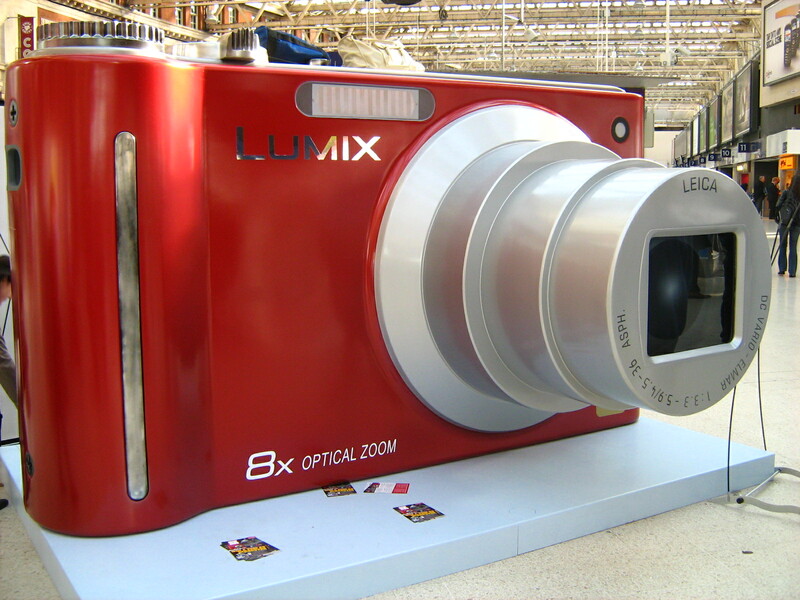 Giant Camera Moves to London Victoria Train Station, the Last in Panasonic’s Series of Larger than Life Installations: A giant camera has been spending time in London train stations as part of Panasonic's 8 x Life campaign to promote their new digital camera, the Lumix DMC-ZX1. Tomorrow it will move to London Victoria. This larger than life installation follows in the footsteps of a giant pigeon, which provided a spectacle in Covent Garden, and five other giant sculptures around the UK. A giant camera appeared in London Waterloo station last week, providing passers-by with a fun visual attraction whilst going about their day. And, rumour has it; it’s making its way to London Victoria station tonight. 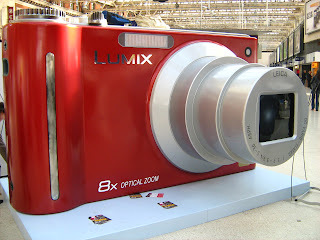 The larger than life camera is the last in a series of objects which have been magnified and brought to life by Panasonic as part of their 8 x Life campaign to illustrate the powerful 8 x optical zoom lens of Panasonic’s new super compact digital camera (http://www.panasonic.co.uk/html/en_GB/Products/LUMIX+Digital+Cameras/Overview/287246/index.html), the Lumix DMC-ZX1. The sculpture incorporates Panasonic’s 103” plasma TV (http://www.panasonic.co.uk/html/en_GB/Products/Viera+Flat+Screen+Televisions/Plasma+TVs/Plasma+overview/2525930/index.html) screen, posing as the camera’s LCD screen on the back of the camera. Displaying video footage of how the giant sized objects were built, as well as footage of all the objects in location on the plasma TV, the creation is so life-like you feel like you’re actually watching a home movie back on your digital camera! A team of six artists spent five weeks creating the 3.6 metre high and 2 metre wide fibre glass digital camera installation, which began its journey in London Waterloo station on Thursday last week (19th November). The larger than life camera, which weighs 160kg, will now be entertaining commuters at London Victoria station from 26th-28th November before moving again to London Liverpool Street Station (3rd-5th December). Mark Robinson, Head of Lumix Marketing at Panasonic, says: "We’ve received some fun and imaginative photos on our facebook page showcasing perspective resulting from our larger than life sculptures. We’re sure our giant sized camera will prove a popular past time for commuters and help to raise the profile of our 8x life campaign." Users are invited to join in with Panasonic’s 8 x Life campaign by submitting their own photograph which showcases the fun that can be had with perspective. Entrants should visit the Panasonic Facebook Fan Page (http://www.facebook.com/8xlife) for the chance to win a trip to the 2010 Vancouver Olympic Winter Games! 101 Top Online Stores to Shop at on Black Friday and Cyber Monday: Wondering which online retailers will be offering the best bargains for the holidays? Iteya.com has done all the searching and ranked the 101 online stores to shop at during the year's biggest shopping season. Additionally, users will be able to receive free Amazon and eBay gift cards with their orders. It's a fact that the internet has made holiday shopping simpler and cheaper. Well Iteya.com has just simplified the simple and cheapened the cheap. This site has searched, categorized, and ranked the 101 online stores to shop at this holiday season (http://www.iteya.com/holidaycoupons.aspx) while also allowing its users to earn free Amazon and eBay gift cards with their purchases. Black Friday is right around the corner and many stores are going to be offering doorbuster deals that will save consumers up to 70% or more off retail. However, with these reduced prices also comes the hassles of having to get up early, drive in traffic, and fight the crowds. To avoid these hassles but still receive the discounts, many people are now doing their holiday shopping the Monday they return to work after Thanksgiving, hence the term "Cyber Monday". Thousands of online merchants will be offering percentage off coupons, price markdowns, and free shipping offers from Black Friday to Cyber Monday, and some even through the end of the year. With all these stores, it may be troubling to figure out which ones will be offering the best product deals. Well the people at Iteya.com did their research and filtering to create a list of the 101 stores to shop at on Black Friday & Cyber Monday 2009. This list breaks down the 101 stores into 17 product categories and ranks those stores within their category, making it even easier to decide where to buy merchandise at. * 70% Off Mineral Makeup with code CM70MIN on Cyber Monday only at e.l.f. "It blows my mind to see how good of deals these stores are offering," said Richard Spore, owner of Iteya.com. "For instance, I just got back from a Vegas trip where I took 54 pictures and the place where I normally get my photos developed costs 20 cents per print. I then noticed Kodak Gallery is offering a holiday special (http://www.iteya.com/holidaycoupons.aspx#Office) where you only pay 9 cents per print and can get your first 50 prints free if you're a new member. For what normally would've cost me over $10, I was able to get for only 36 cents." On top of the holiday savings, Iteya's users will be able to earn points toward Amazon and eBay gift cards with their purchases. For a free membership (http://www.iteya.com/IteyaLogin.aspx) of Iteya.com, just click on the Sign Up link in the upper right-hand corner of their website and enter the 3 required fields. Coincidentally, Amazon and eBay were ranked 1 and 2 respectively in the Department & Megastore category. However, it is recommended to shop at the other stores on the list first. That way, points earned from those purchases can be redeemed for a gift card code through email, which will deduct an amount off the total order at Amazon or eBay when entered at checkout. For more information, please visit http://www.iteya.com or call 717-823-7863. Creative Unveils Elegant New Design with Third Generation Vado HD: Creative, a worldwide leader in digital entertainment products, today announced the chic third generation Vado HD Pocket Video Cam, combining a sleek design with stunning HD video quality. “We’ve won prestigious awards and accolades for the great performance, ease of use and compact form of our Vado HD cameras. 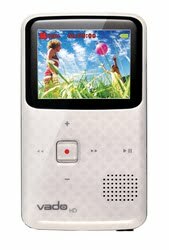 The third generation Vado HD brings a cool new design and adds additional features to the already award-winning feature set. The design looks so cool people will stop you on the street and ask you where you got it,” said Steve Erickson, VP and GM for audio and video at Creative. 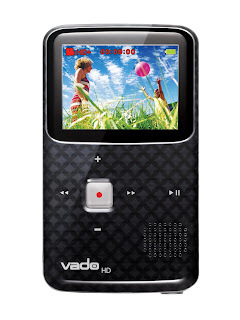 The third generation Vado HD also features new Vado Central 3.0 software with more instant web uploading capabilities and integrated editing options. Users can simply select one-click uploading to a number of popular social media sites, including Facebook and YouTube, and their videos will be ready to view or share in a matter of minutes. For users who don’t want their videos to be shared publicly, videos can be uploaded to KinKast via one-click uploading and then those services offer a variety of other features, including an email invite option for a more private viewing experience. Simple video editing capabilities enable users to edit videos directly in Vado Central 3.0. For more advanced editing options, users can edit videos in other editing programs, including iMovie and Movie Maker. The third generation Vado HD with better compression can still hold more than 90 minutes of HD quality video or up to 7,000 still photos in 4GB of onboard storage. The removable rechargeable battery provides more than two hours of recording or viewing. Users can easily recharge the battery via the flexible, pull-out USB cable, with no additional cables required. Extra batteries and a wall plug-in battery charger are also available.